Declaring that AIDS Support Group of Cape Cod’s (ASGCC) needle access program “saves lives,” a Superior Court judge, in a first-of-its kind ruling, issued a preliminary injunction against the town of Barnstable, which had tried to shut down a needle distribution program run by the group in Hyannis. The injunction ensures that ASGCC can continue providing its life-saving services to injection drug users. The decision is the first to affirm the meaning of a 2006 Massachusetts law that removed restrictions on the possession and distribution of needles and syringes. “An Act Relative to HIV and Hepatitis C Prevention” was passed to enable injection drug users to get sterile needles and syringes, critical to stopping the spread of disease. 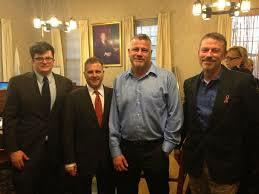 Gay & Lesbian Advocates & Defenders (GLAD) and AIDS Action Committee of Massachusetts (AAC) represented ASGCC in court during a two-day hearing, at which experts in public health, HIV and Hepatitis C prevention, and drug addiction testified in support of the program. “We’re extremely happy and relieved. We can now continue helping to stop the spread of HIV and Hepatitis C on the Cape, and assisting the members of our community who inject drugs to get the services they need,” said Max Sandusky, ASGCC’s Director of Prevention and Screening Services. AIDS Support Group distributes needles and syringes in the context of comprehensive care for injection drug users, including counseling, testing, and referrals to treatment, health care, and social services. The town issued a “cease and desist” order to AIDS Support Group prompted by the improper disposal of needles in town, despite the fact that AIDS Support group annually collects more needles (115,209) than it distributes (112,604). “This was the right decision. The Cape Cod community has been hit hard by the opioid crisis. Now is not the time to pull back services,” said Andrew Musgrave, AAC’s Director of Legal Services.